ZTE has officially announced its 5 inch Full HD smartphone, ZTE Nubia 5 phablet, which for now is available in USA for $450 (~27,500 INR). We expect this quad core camera specific smartphone to come in India soon as a mid range smartphone. 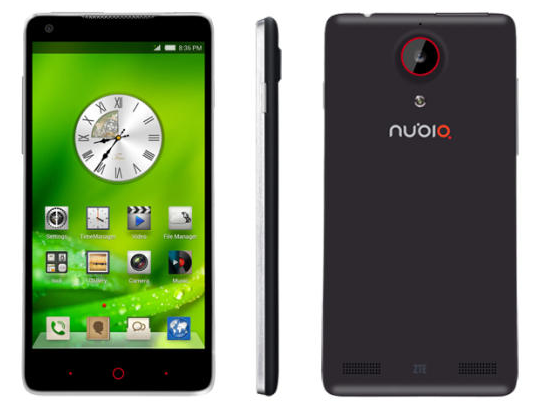 Nubia 5 is powered by 1.5GHz quad-core Snapdragon S4 Pro processor backed by 2 GB RAM and 16 GB of internal storage. The internal storage is not extendable and the device lacks MicroSD support. The processor is a powerful one and will give you smooth multitasking and UI transitions. ZTE Nubia 5 features a 5 Inch Full HD 1080p display amounting to 441 ppi similar to the pixel density we see in high end smartphones. The display type has not been specified. On the software front phone will feature Android 4.1 Jelly bean O.S. The battery capacity is 2300 mAh which is expected to last one day with moderate usage. ZTE has also provided with Digital Dolby plus for enhanced audio experience. A good camera phone is always welcomed in Indian market. Nokia provided with its 41 MP PureView Camera in Lumia 1020 and the rest of the manufacturers are now catching up. In India this device will compete against phones like Nokia Lumia 925, Sony Xperia ZR, LG Optimus G and Sony Xperia Z.